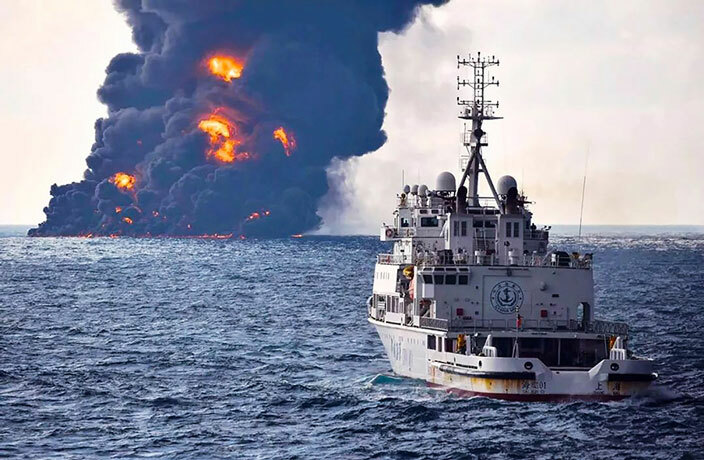 On Tuesday, January 8, an oil tanker called Aulac Fortune made headlines after a fire and series of explosions crippled the vessel south of Hong Kong’s Lamma Island. At least one person has died and it’s presently unclear to what extent the marine environment will be impacted by the accident. In light of this week’s tragic events, we’ve decided to take a look back at some of the notable maritime disasters and accidents that have occurred within the Middle Kingdom’s borders in the 21st century. Early on the morning of Sunday July 15, 2018, freighter Shunqiang 2 collided with another vessel while transporting 3,000 tons of steel from Nanjing in Jiangsu to the southern city of Guangzhou. After the collision, Shunqiang 2 dipped below the surface of the water and sank near Shanghai's Wusongkou Port. Emergency teams were dispatched to aid in the rescue efforts and three of the 13 crew members were quickly pulled from the water. Unfortunately, a number of the vessel’s cabins were locked at the time of the collision and some of the sailors were asleep. At least seven bodies were recovered. At around 12.46am on the morning of February 22, 2018, a packed passenger ferry traveling between Hainan Island and Guangdong province struck a steel-packed freighter, which sank as a result of the collision. Three crewmembers from the cargo ship were rescued, although two were deemed missing in the wake of the accident. It is unclear if the missing individuals were ever found. Fortunately, the ferry, which was carrying over 970 passengers and 140 vehicles, made it safely to port by 6am the same morning. Thirty-two sailors are assumed to have perished after the oil tanker Sanchi, which was carrying 136,000 metric tons of condensate oil, collided with a Hong Kong-registered freighter on the night of January 6, 2018, while en route to South Korea. The incident occurred roughly 296 kilometers to the east of the Yangtze River estuary in Shanghai. The Sanchi caught fire shortly after the collision and ended up drifting and leaking oil for over a week. Between 3 and 5pm on January 8, the fiery inferno sank. While all of the freighter’s 21 Chinese personnel were saved, tragically the 32-member crew of the Sanchi are all assumed to have died in the disaster. The Sanchi’s crew was made up of 30 Iranians and two Bangladeshis. At the time, experts were divided on the potential environmental impact. A year later, we’re unable to find an environmental assessment on the area where the ship sunk, an area that supplies roughly 40 percent of China’s fish harvests. While Typhoon Roke was cruising over the Pearl River Delta on July 23, 2017, bringing rain and the occasional gust of wind to Guangzhou and Shenzhen, a rescue operation was underway off the coast of Huizhou to recover 12 sailors forced into the ocean when their vessel capsized. The incident happened in waters near Daxing Mountain, when freight on the cargo ship shifted position – causing the vessel to tip precariously. Rescuers were dispatched by the Nanhai Rescue Bureau of the Ministry of Transport and Hong Kong SAR Flying Service. Utilizing helicopters and ships, they were able to safely retrieve all 12 seamen who had abandoned their sinking vessel. In late November of 2017, a cargo ship carrying 5,000 metric tons of sand sank near the Pearl River estuary after colliding with another vessel carrying 5,000 metric tons of steel. While the metal-hauling boat made it safely to shore with all 11 crew members after the crash, the sand freighter sank with five sailors trapped in the cabin. Roughly 300 people participated in the rescue efforts, including 47 divers. Unfortunately, despite their efforts, at least two of the sailors perished (we were unable to find reports on the fate of the other three seamen). Seven other boat personnel were rescued from the water and transported to a hospital. In early October of 2016, a 100-metric-ton Chinese fishing boat rammed into a ‘pint-sized’ 5-and-a-half-metric-ton Korea Coast Guard vessel after being busted fishing illegally in Korean waters. The Korean patrol boat sank as a result of the encounter and the crew were forced to abandon ship; they were rescued by another nearby vessel. The Chinese fishing vessel promptly fled the scene of the crime. While this event did not result in any loss of life, other encounters over the past decade between Korea Coast Guard boats and illegal fisherman from China have: the skipper of a Chinese fishing boat was shot and killed during a similar encounter back in 2014, and in 2011 an officer from Korea Coast Guard was killed. A tourist from Shanghai survived 38 hours alone in the ocean after falling from a cruise ship back in August of 2016. The ship, named Mariner of the Seas, was traveling to Wusong Port in Shanghai from Fukuoka, Japan. China’s worst maritime disaster of the 21st Century, and arguably the deadliest maritime disaster during the nation’s peacetime history (if you exclude the SS Kiangya, which is believed to have hit a forgotten Imperial Japanese Navy mine in 1948), 442 people perished in June 2015 when the Eastern Star ferry capsized on the Yangtze River. In total, 454 people were onboard the vessel and only 12 survived. The ship was traveling from the capital of Jiangsu province, Nanjing, to Chongqing, and overturned sometime around 9.30pm in Hubei province, near the city of Jingzhou. Chinese President Xi Jinping released a statement urging an “all-out rescue effort,’ and Premier Li Keqiang visited the site of the disaster twice to pay his respects to the victims. While it was initially thought that a tornado may have hit the ferry, it’s now believed that the ship’s fate was the result of strong winds during a thunderstorm. National Day 2012 was not the day of revelry many had hoped in Hong Kong. Usually a day to celebrate the founding of the People’s Republic of China, October 1, 2012 was a day of sadness and dismay after a collision between two vessels – one of which a ferry – that resulted in 39 deaths. The disaster occurred sometime around 8.20pm off the coast of Lamma Island and involved passenger vessel Smooth Sea and Lamma IV, a boat owned by the Hong Kong Electric Company. In addition to the 39 fatalities, 101 people were injured in the collision, which was the deadliest in Hong Kong in four decades. The captains of both boats served time in prison for their roles in the disaster: the skipper of the Lamma IV did nine months in the slammer for endangering the safety of others at sea, while the Smooth Sea’s captain received a sentence of eight years behind bars for manslaughter. With files from Lauren Hogan and William Lee. Additional research by Jikai Zheng.